The Marion County GOP headquarters in Ocala, Florida, is haunted. More specifically, the former movie theater that housed the headquarters was haunted, until it was torn down this summer to make way for a parking lot. And yet, for Republicans looking to volunteer in Ocala, the county GOP’s website still lists its address as the recently razed home of “Morris” the ghost. Directing would-be volunteers to demolished buildings (and their now-homeless ghosts) is just one risk of outsourcing field operations to state and local parties. Both the Hillary Clinton and Donald Trump campaigns are coordinating field efforts with their party, but Trump is leaning on the Republican National Committee almost entirely. Until a couple of weeks ago, the Ocala office was one of only a few offices in all of Florida working to elect Trump. That lonely, haunted Ocala non-headquarters exemplifies Trump’s ground game strategy — ephemeral and ineffectual. Trump’s decision to partner with the RNC, though framed as being more efficient, robs him of the opportunity to organize in areas where the state or local party is not already strong. Many county parties don’t have an office, and even when they do, their leadership may prioritize electing other statewide or local GOP candidates. In Wisconsin, for example, many of the state party’s Victory offices predate the 2016 campaign and seem more focused on U.S. Sen. Ron Johnson’s re-election. Campaigns simply don’t have the money or the staff to set up offices everywhere, so they put them in areas where they expect voter mobilization (such as door knocking, phone banking and distributing yard signs) might be most impactful. Offices that primarily advocate for down-ballot candidates, or are located inefficiently, won’t have the same payoff as logically placed, coordinated campaign offices focused on the party’s nominee. In 2012, both Barack Obama and Mitt Romney’s campaigns opened their field offices strategically: Obama focused most offices on mobilizing Democrats in his “core” counties, while putting offices in “swing” and Republican areas equally. Romney invested equally in core Republican counties and swing counties, while generally avoiding heavily Democratic areas. Clinton’s operation is already much larger than Romney’s was, however. Her 489 total offices well exceed Romney’s 283, with larger disparities in battleground states (75 vs. 40 in Ohio; 57 vs. 25 in Pennsylvania; and 29 vs. 14 in Colorado). On the Republican side, Trump’s operation lags well behind Romney’s. Romney had far more offices than Trump does in battleground states like Iowa (13 vs. 6), North Carolina (24 vs. 11), and Virginia (29 vs. 11). Of the 10 most critical states, Trump’s field offices exceed Romney’s only in Pennsylvania, which Trump currently has only about a 20 percent chance of winning. Trump has so far failed to match the organization of his Republican predecessor. In 2016, like in 2012, it is not close. 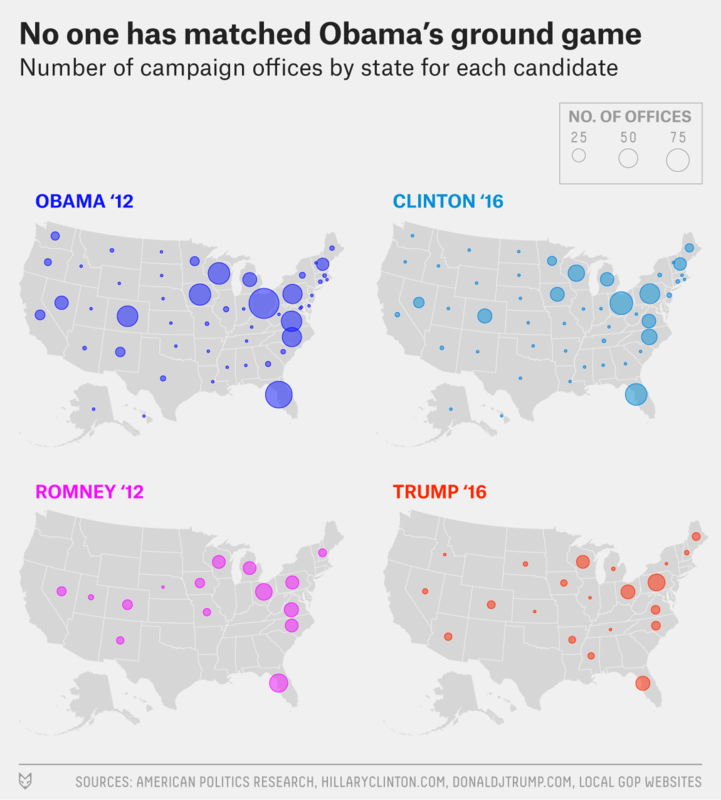 Clinton has more than twice as many field offices as Trump nationwide (489 vs. 207), and her organization dominates Trump’s in every battleground state. Clinton’s offices outnumber Trump’s by 20 in New Hampshire, 22 in Iowa, 20 in Colorado, and 27 in North Carolina. In the states where Trump has opened the most offices, such as Pennsylvania (42), Florida (29) and Ohio (22), Clinton’s advantage remans large: She bests him by 15 offices in Pennsylvania, 39 in Florida and 47 in Ohio. Trump’s ground game is far from nonexistent, but his campaign simply does not have the infrastructure to match Clinton’s capabilities for voter contact and mobilization. North Carolina illustrates the problems with Trump’s field office locations well. We found 11 Trump offices in the Tar Heel State. Most are found near population centers that are friendly to Clinton, such as the counties containing Charlotte (which Obama carried with 60.7 percent of the vote in 2012), Asheville (55.3 percent for Obama), and Raleigh (54.9 percent). Clinton’s campaign, on the other hand, has the Democratic-leaning and voter-rich counties containing Durham (75.8 percent for Obama), Fayetteville (59.4 percent) and Greensboro (57.7 percent) to themselves. Romney opened offices in all of these counties in 2012, but Trump is leaving them uncontested on the ground. The scarceness of Trump’s offices in several of his must-win states, and their unclear focus on his candidacy, cast real doubts on the Republican nominee’s ability to get out the vote. Clinton’s edge in battleground states will allow her campaign to focus on getting her voters to the polls, target those on the fence and find the Democrats in deep-red counties. If Trump’s chances of winning depend upon disaffected rural voters and previously unregistered Republicans, as some have suggested, those voters may need to mobilize and persuade themselves: The campaign simply does not have the organizational scope to reach them. Clinton’s field offices were also much simpler to find online. Just this week, Trump’s campaign introduced a “States” section on its site with lists of offices — for only six states.3 Before that, it was very difficult to locate Trump offices: We were determined to find them and spent many hours looking. How many would-be Trump volunteers just gave up? Clinton’s site is much more straightforward, directing people to their nearest office with a simple ZIP-code entry tool. Field offices are only as effective as the volunteers they can attract, and supporters need to know where they are — though, too often, they are nowhere to be found in the places Trump will need them the most. Research shows that field offices can earn campaigns about a 1 percentage point increase in vote share per county. That effect may sound small, but it was enough to change the outcomes in North Carolina — and possibly Florida and Indiana as well — in 2008. If Trump is behind on Nov. 8, he won’t be able to rely on his ground game to make up the difference. Kirill Bryanov and Christianna Silva contributed research. UPDATE (Oct. 7, 11:20 a.m.): To better show the relative size of the candidates’ field operations in each state, the maps in this article have been updated so that the area of each circle, rather than the circle’s diameter, is proportional to the number of field offices. CORRECTION (Oct. 11, 4:37 p.m.): Because of a data-merging error, a previous version of this article incorrectly depicted counties with multiple Trump offices as having only one. The text and graphics have been updated to reflect the full data set. State-level Trump office totals are slightly higher in some states as a result. Data was collected between Sept. 28 and Oct. 4. Offices are included only if they have verifiable addresses: We do not rely on the aggregate numbers claimed by either campaign. As such, these totals may undercount offices. Republican National Committee offices, “Victory” or “Victory 365” offices run through the coordinated campaign, or locatable county offices in battleground states were considered Trump offices. Trump’s website, as of Thursday, listed office locations in only six states. Information on other states was gathered from those state party websites, county party Facebook pages, and the website p2016.org. Office openings mentioned in news reports were included when addresses could be located, and state party headquarters were excluded unless specifically listed as a Trump office. To locate Clinton’s offices, we used the “Find your closest field office” feature on her campaign website. Data on Obama and Romney offices comes from my article on this subject, co-authored with Matthew Levendusky, in American Politics Research. It’s hard to say how many offices Obama had at this point in the 2012 campaign, or how many offices Clinton is likely to open between now and Election Day, because opening dates for 2012 offices aren’t available. A quick search of Clinton’s “Events” feature on her campaign website reveals very few upcoming office openings. Florida, Iowa, Nevada, North Carolina, Ohio and Pennsylvania.